Check out some links that I strongly recommend!! You may have noticed but we don't sell advertising on any of our websites. We are committed to providing the people who visit our site with the most objective, reliable, valid, and useful information, resources, and materials that we have created, discovered, or experienced during our life and ministry. None of the services or ministries listed below have paid to be on our sites ... some don't even knowwe are supporting them. But all of them have in some way, shape, or form been useful to us and so we are passing them on to you. A brief explanation is written next to each resource. Click on the image to go directly to their site. God bless you in your endevours! Discipling people in the DISCOVERY of their IDENTITY, PASSION, and PURPOSE through effective communication, ministry, and support. RTW is a discipleship ministry that exists for the specific purpose to provide the opportunity for people to develop a stronger understanding of who they are in Christ and enable them to walk it out freely. - focuses on introducing and strengthening a person in Christ knowing that whatever struggles a person may face with their hurts, habits, or hang-ups can be best rectified in Jesus. Spreading Joy Corporation is dedicated to reminding other that they can make a difference by doing what they can, where they are with what they have; thus enriching our communities by encouraging individuals to focus daily on others. Jcmix is a media outreach organization that provides an outlet for youth to grow in the developmental skills of the creative arts for the purpose of helping build a better community, moral character, and help spreading the Gospel. This is a powerful media ministry to the youth of today. I know the guy behind the scenes personally, this is a site you want as a resource for your ministry!!! Ken is an awesome evangelist able to deliver powerful messages in methods that multiple generations can understand. 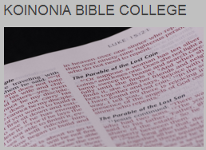 The Therapon Institute offers Biblical Counselor Certification based upon our exclusive faith-based therapeutic treatment model, Belief Therapy, not solely as an alternative to traditional treatment and recovery programs, but to help identify life-controlling problems and to process the deep spiritual recovery issues of hurting and healing people. Our desire is to be accessible and affordable, yet without compromising the depth of teaching. Our instructors are carefully selected for their area of expertise, as well as their spiritual commitment and knowledge of the Word. e-Sword is a fast and effective way to study the Bible. e-Sword is feature rich and user friendly with more capabilities than you would expect in a free software package. The fact that e-Sword is free is just one of the blessings and does not speak of the quality of the software. I make my living writing software and I believe I have put forth my best effort in this endeavor. E=Sword has been my program of choice for years now. It is extremely user friendly and has loads of peripheral documents such as concordances, commentaries, dictionaries, topical indexes, maps, devotionals, and countless translations. generate research and study material, comparing groups such as Islam, Jehovah's Witness, Mormonism, and Freemasonry with Christianity. This ministry was founded by Ed Decker, a man delivered from the Mormon cult. SongSelect is the most comprehensive legal source for worship song chord sheets, lead sheets, vocal sheets, lyrics and sound samples..saving you hours of preparation time. SongSelect is available to churches and organizations with a current, valid Church Copyright License with CCLI. "Movie clips that illustrate and inspire." Using this awesome resource you can view inspirational movie clips from many of your favorite films. These WingClips™ can also be downloaded to use in your school, church or other organization. © 2004–2014 WingClips, LLC. All rights reserved. MOTION PICTURE ARTWORK, PHOTOGRAPHY AND VIDEO are property of their respective owners. Their use is subject to the terms and conditions of this web site. We are a network of Internet radio shows (called “podcasts”) that challenge you to think, encourage you to laugh, and enable you to succeed. All of our shows are clean and family-friendly (though some episodes may cover more mature discussions). This is an awesome site for quickly downloading free chord charts for worship songs in a jam. The formatting is a little querky but it easily pastes into a Word document and can be easily edited from there. The variety is impressive and there are usually multiple versions of the same song which offers choices in chord progressions and keys. A must have for a worship leader! This is a great resource site for anything to do with family matters!! Every drama/theater team should have this web-based company bookmarked. If you can dream it, they can design it. Christian owned and operated but their services are worldwide. Also design peripheral light sysyems (most commonly used as Christmas Lights). Top rated construction company in tri-state NY region. Developer of patented system to guarantee roofs are sealed. The following links are must-haves for travel. I strongly suggest considering them as valuable resources when planning your next trip, especially if going out of country.